Christopher, Susan and Caitlin McConnel were honoured to receive congratulatory correspondence from Her Majesty, Their Royal Highnesses the Duke & Duchess of Cornwall, His Excellency General the Honourable Sir Peter Cosgrove AK MC (Retd) and His Excellency the Honourable Paul de Jersey AC, amongst other dignitaries and parliamentarians, on the occasion of the family’s 175th anniversary celebrations at Cressbrook in 2016. The significant milestone, reached on 15th July 2016, was celebrated by way of a private Service of Thanksgiving attended by friends and immediate family at Cressbrook on 29 October 2016. In an historic milestone for Cressbrook and Australia’s history, Christopher and Caitlin McConnel were honoured to host Ludwig Leichhardt (Jnr) at Cressbrook on Friday 24 October 2014. 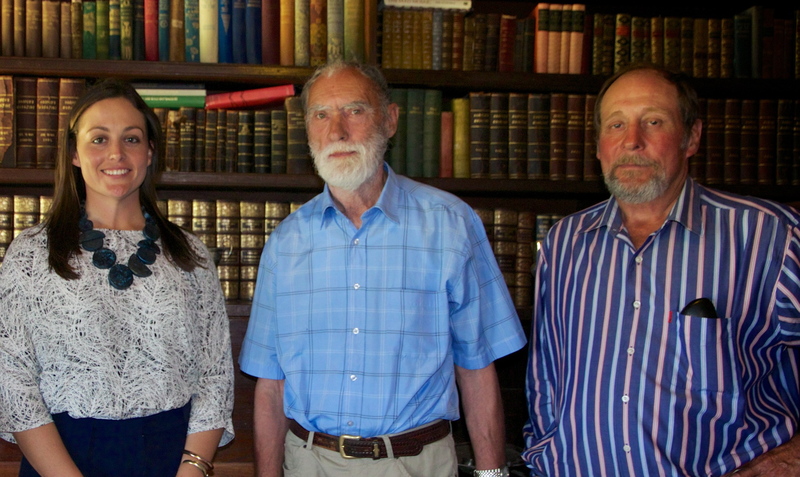 The McConnel family at Cressbrook is the only family in Australia whose ancestors hosted Ludwig Leichhardt, the explorer, as well as his great-great-great-nephew Ludwig Leichhardt (Jnr), and who still reside in the original family home. With only minor changes made to the original slab wing of the Main House at Cressbrook, Ludwig Leichhardt (Jnr) visited the exact rooms were his ancestor resided with the McConnel family on his stay in November 1843 – nearly 171 years to the day. Ludwig Leichhardt (Jnr) was in Australia as a guest of the Australian Government to celebrate the 170th anniversary of the start of Ludwig Leichhardt’s Great Overland Expedition from Moreton Bay to Port Essington (1844-1845). Commemoration events were held throughout Australia for a number of weeks, with celebrations culminating in Brisbane on Tuesday 28 October 2014 with the naming of Qantas’s newest Boeing 737, ‘Leichhardt’, in the explorer’s honour. In 1954, a sidesaddle owned by Mary Elspeth McConnel (daughter of J.H. and Madge McConnel) was prepared for Queen Elizabeth II in case she wished to ride it during her visit to Brisbane in her Royal Tour to Australia. The sidesaddle, still owned by 5th generation McConnel, Mrs Rosemary Neumann (eldest daughter of Duncan and Erica McConnel), is lined with a Red Deer skin, which was shot at Cressbrook and still bears the markings of its maker F.W. Mayhew of Seymour Street, London who was under Royal Warrants of Queen Victoria, King Edward VII, King George V, King Edward VIII, and King George VI. In 2012, Caitlin McConnel (only child of Christopher and Susan McConnel) was selected by the Australian High Commission and Surf Lifesaving Australia as the official spokesperson for Australia Unlimited, the Australian High Commission in London and Surf Lifesaving Australia whilst representing Australia in the Queen Elizabeth II’s Diamond Jubilee River Pageant in London as part of the Australian surf boat team. Erica Webster McConnel (nee St Clair), wife of fourth generation custodian of Cressbrook, Duncan Cannon McConnel was a descendant of the Lordly line of high St Clair, Scotland (with all descendants recognised as a collateral branch of Lord Sinclair). Subsequent generations of the McConnel family are also descendent the collateral branch of Lord Sinclair, including current custodian of Cressbrook, Christopher David McConnel and his daughter, Caitlin Jane St Clair McConnel. Cressbrook and the McConnel family hosted The Honourable William George Hayden AC and his family at a private event in 1996. In 1915, His Excellency stayed as a guest of Mrs. J.H. (Madge) McConnel at Cressbrook on the eve of the First Bushmen’s Carnival at Esk, where he was guest of honour. Around 1897, Lord Lamington was a guest of Mr. J.H. McConnel at Cressbrook, where he was able to enjoy sport including deer stalking and duck shooting. It was on this trip that Lord Lamington shot a Red Deer which was sent back to England for use in Queen Victoria’s Diamond Jubilee celebrations. In 1873, Queen Victoria sent a gift of two Red Deer stags and four hinds from the Windsor Castle gardens to the state of Queensland, so called in her honour. They were released on Cressbrook in an event still celebrated by the McConnels, and historians in Windsor, UK. Subsequent releases of deer continued on Cressbrook up to 1878, descendants of which are still seen in the Brisbane Valley today. In 1897, the Right Honourable Lord Lamington GCMG GCIE shot a Red Deer at Cressbrook which was sent back to England for use in Queen Victoria’s Diamond Jubilee celebrations. In November 1843, D.C. McConnel hosted Prussian explorer Ludwig Leichhardt at Cressbrook. He viewed the district from Mr McConnel’s Sugarloaf (at Scrub Creek) and Mr Balfour’s Sugarloaf (aka Mt Williams) at Gregors Creek. Taken from ‘The Leichhardt Diaries’ as edited by Thomas D. Darragh and Roderick J. Fensham (2013). Leichhardt stayed at Cressbrook for a number of days, surveying and documenting much of the surrounding country. Significantly, D.C. McConnel and his brothers John and Frederic were some of the private financial contributors to Leichhardt’s first expedition from Moreton Bay to Port Essington, as initial government-sponsorship was withheld. As a consequence, Leichhardt named some landmarks after our family, including Mt McConnel, situated between Mt Coolon and Charters Towers, on the tributary of the Belyando River.